Have you ever been excited buying a cool top for your kids from a big brand shop only to walk down the street and see other kids wearing the same thing? 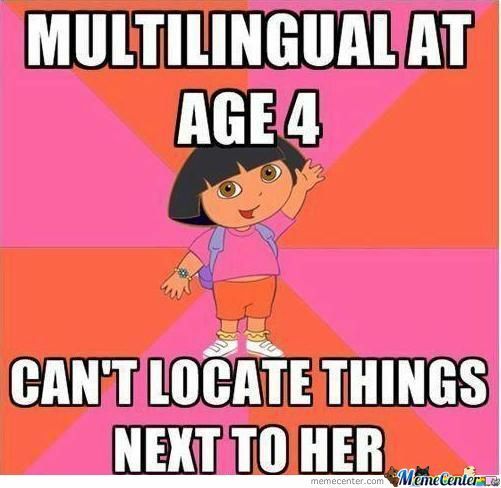 Have you ever walked into a shop, looked over the racks of Dora the Explorer, pink fluff and a couple of shirts with trucks on them and just thought…. meh…..? Frustrated by her own attempts to shop for her new baby boy and not being able to find anything remotely cool, Katie started making her son’s clothes herself. She was stopped so often and asked where his clothes came from that the next natural step led to her creating her shop, Punk Baby. 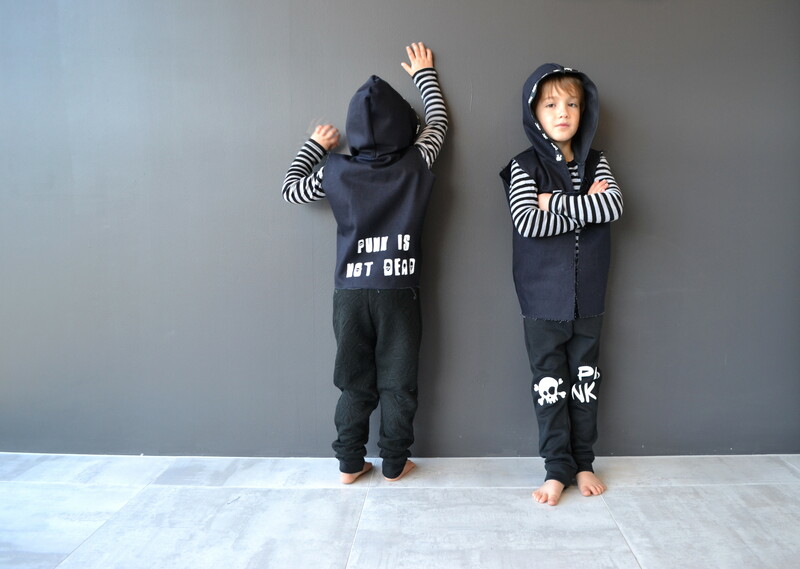 Punk Baby is all about letting kids be individuals, standing out in a crowd and expressing themselves through funky fashions. The clothes are made in limited numbers to ensure your kiddies will be setting the trend, not following it. PB: For the longest time it has just been me, over the last couple of years I have had 2 casual seamstresses on hand that will back me up when I get too busy sewing, but I still mostly make everything myself. PB: I actually didn’t intend to start a business, it kind of all spawned from a viral image of my newborn wearing a shirt I had hand painted him and all took off from there. Orders started rolling in via social media and I wasn’t actually even trying to sell anything! I think I just came along to the right place at the right time and was providing items for a niche market that wasn’t being catered for. PB: I was actually a jewellery designer BC (Before Children) – I had worked independently, as well as managing a jewellery store that had 5 different shops around the country – which funnily enough taught me a lot about how NOT to run a business! I’m a gemini too – so although I am very creative, I’m also very business minded and love the whole business planning and numbers game, which is rare for a creative, so I feel like I was well set up to begin with. But I learn new things every week, and the face of business, esp with social media, things can change so quickly that you can never think you’ve learnt it all! PB: I was very lucky to have a business that grew organically without me trying to push it, so it was a gradual climb that meant I could really ease myself into it. The most resistance I get now is from the crowd of naysayers that think putting skulls on children is ‘disgusting’ and will give them nightmares and make them grow up to be sociopaths. I fully realise that this sort of thing is not for everyone, and that’s great, we are all individuals after all and that is what Punk Baby is all about – but seriously – I was always taught if you don’t have anything nice to say, don’t say it at all! I personally hate children’s clothes covered in pastel and puppies, but I would never go and tell those mothers how much they make me want to barf! PB: This year both my children are at school, so I now get 5 days a week in school hours to work, its never enough though when you are not only running the company, but you are also the person that makes all the products! As soon as the kids are in bed I am cutting/prepping for the next day – I find it easier to just get home after school drop off and get going if I have a pile of already cut out things I just need to sit down and sew. PB: When I was set to return from maternity leave to my previous job after baby number 2 – they rung me up the day before I was due to start back and told me not to bother coming in, I would now be ‘unreliable’ because I had 2 children. So from that point on Punk Baby became my families income and I really had no choice but to lift it from hobby business to actual business to pay the bills. So I need to be really careful about what direction to take the business in to ensure that it can still provide for our family. I try not to work when the kids are at home, actually lets just say it is impossible to work when the kids are at home anyway! But it means a lot of late nights and a lot of hussling through nap times etc to get things done. Punk Baby is so my family and our style and our values, that all these things kind of meld together. My son is always telling people about Punk Baby, I think I’m going to have to start paying him commission! PB: I told someone the other day that I have loved Bad Religion for 15 years, and that made me feel really old. I later realised that I totally underestimated how old I actually am and it’s more like 20 years haha! (PM: Don’t worry Katie, it’s been 26 for me!) But I just love the fact that they are still rocking out, Greg is such an expressive performer and their lyrics are amazing. NOFX is another fave, if you could go anywhere and be accepted with a true ‘come as you are’ attitude, then it would be hanging with NOFX. PB: In the weekends we head to the beach, we live in a beautiful region that is saturated by sunshine all year round, so spend nearly every weekend beaching it and drinking coffee. If we’re not at the beach, then you’ll find us at the skate park. PB: I would love to get a bit more International. New Zealand is a small country at the bottom of the Earth and its very easy to feel like you’re a bit buried under a rock here, and only having a population of 4.4 million people in the whole country – it would be awesome to reach a larger market. On the plus side for anyone living outside of New Zealand, our dollar is really weak, so our bad exchange rate is like an instant bonus discount to anyone not buying in New Zealand Dollars! (e.g $20 NZ = $12 USD) I’ve also just started doing a wee bit of women’s wear, would love to extend that with more products. 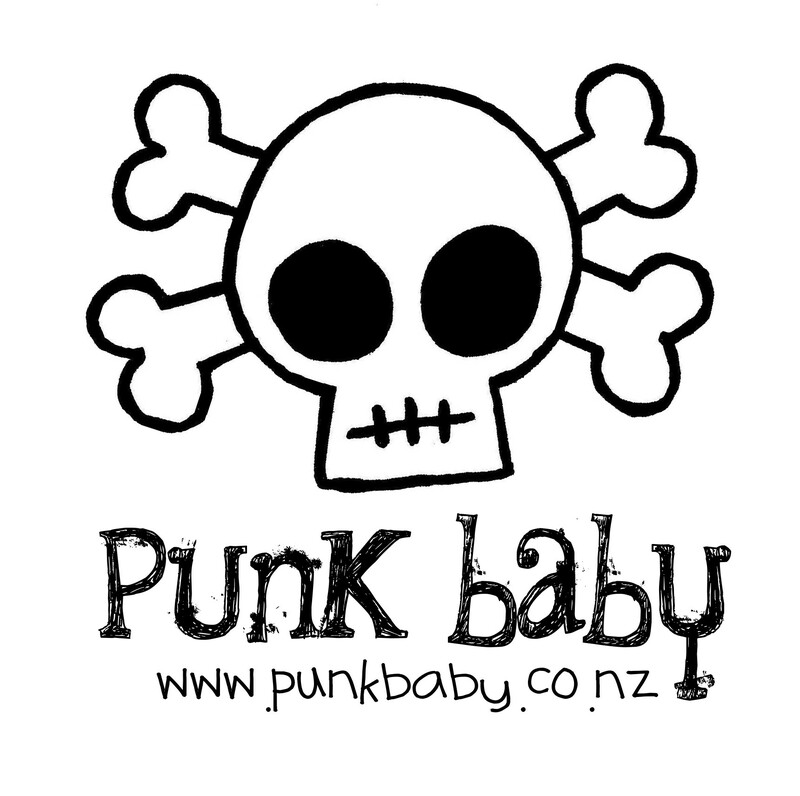 Our readers can enjoy 15% off by using the discount code PUNK and Punk your baby today! What a lovely interview and wishing punk baby all the success and ignore the haters they ain’t important and focus on expanding your brand. Great interview and sounds like Punk Baby is really going places! I think individual style for kids is great and am heading over there to take a closer look at the range for my little ones! Ah, these look great! I love the disclaimer about spellings – made me LOL. It’s amazing that she sews most of these clothes herself and they’re not mass produced somewhere. So cool! I personally love your punk rock collection and there is definitely a gap in the market for this in the UK. I am not a punk in terms of fashion myself but I love the black waistcoat at the top. What a fantastic interview. And how amazing how it came about. I really love these clothes, they look different and really stylish. I love the dress and I am sure my toddler would too! I’m loving this. Anything that stops the constant stream of Next-clothed babies is great in my book! It’s great to support small business so I’m happy to see you featuring one on your site. The clothes look very cool. The clothes look interesting, though not to my personal taste. But I’m sure there is a gap in the market that the line is sure to fill. Wow what a great brand. I love buying things for my son but find that anything I think is great chances are someone else is wearing it and that use to annoy me. I will be placing a few orders from this online shop that is for sure. thanks for sharing. I just love the baby clothing, especially the last one black shirt with cap is just look awesome. 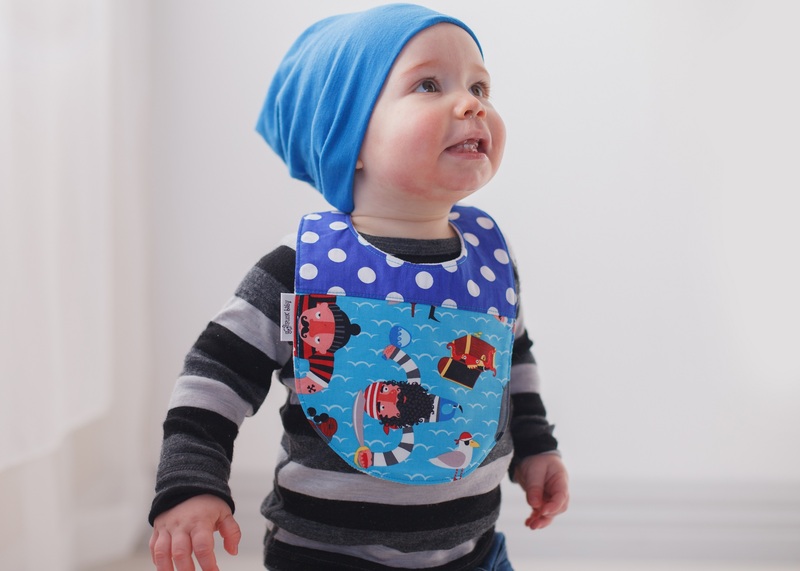 Where to buy these baby cloths in Indonesia?